Approximately four hours of kayaking on the flat water of the Kleinmond Estuary. The Kleinmond Estuary, the western arm of the Bot River – Kleinmond Estuarine System, covers about 1400 ha, from Kleinmond in the west to Hawston in the east. How far to go depends on the water level and kayakers’ energy level. 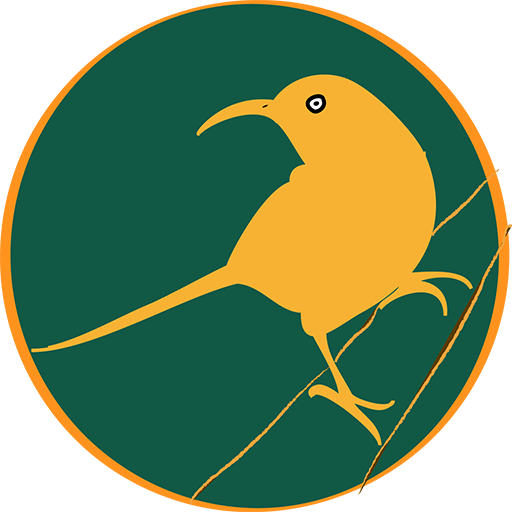 The international conservation organization BirdLife International has identified The Bot River – Kleinmond Estuarine system as an ‘Important Bird and Biodiversity Area’ (IBA). Among the 233 bird species listed in the area, 86 of which are waterbirds, look out for Yellow-billed Duck (Anas undulata), Southern Pochard (Netta erythrophthalma), Red-knobbed coot (Fulica cristata), Cape shoveler (Anas smithii), Black-necked Grebe (Podiceps nigricollis) and Great-crested Grebe (Podiceps cristatus) that breed in the area. Also present at certain times of the year are the Great White Pelican (Pelecanus onocrotalus) and African Spoonbill (Platalea alba). Expect to see a variety of cormorants, gulls, terns and Egyptian geese. Look out for the Pied Kingfisher (Ceryle rudis), Giant kingfisher (Megaceryle maxima) and the colourful Brown-hooded Kingfisher (Halcyon albiventrus) and raptors such as the vulnerable African Marsh-harrier (Circus ranivorus) and the African Fish-eagle (Haliaeetus vocifer). One theory is that Boer sympathizers hid the horse’s forebears in the area from the British Army during the Anglo-Boer War (1899 – 1902). Another more carefully researched theory is that they are descended from a sub-group of the Cape Horse, called the ‘Boland Waperd’, which was the all purpose draft animal of Cape farmers in the 18th and 19th centuries. 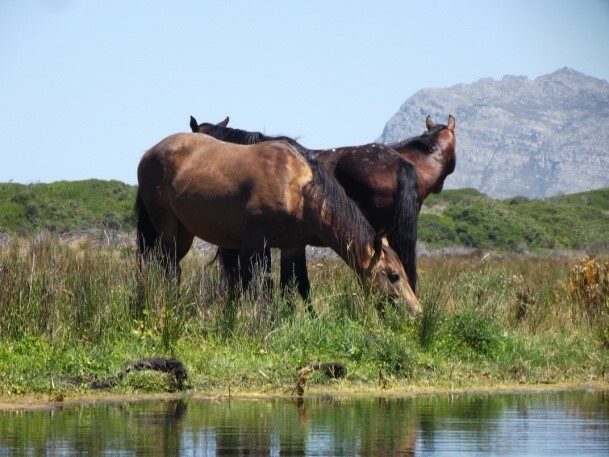 Over many generations the horses have adapted well to their wetland habitat, developing widened hooves and flourishing on the wetland vegetation. In the absence of other large herbivores that once roamed these plains and wetlands, such as eland, zebra, buffalo and hippo, the horses play an important role in the ecology of the area, grazing on wetland vegetation and treading trails through reedbeds which would otherwise choke the waterways. It won’t take long to meet tasselweed. Botanists know it as Ruppia maritima, an important food source and floating nesting material for ducks, grebes, coots and others. Paddle between tall stands of Fluitjiesriet (Phragmites australis) and Bulrush (Typha capensis) that provide cover for a host of birds, including Cape Weaver (Ploceus capensis), Yellow Bishop (Euplectes capensis), African Purple Swamphen (Porphyrio madagascariensis), Common Moorhen (Gallinula chlorophus) Black Crake (Amauroris flavirostra) and many more. Picnic on an island (depending on water levels) where the restio Elegia tectorum occurs, for centuries the preferred thatching material for Khoi and early trekboer homes alike. The Kleinmond Estuary is in Cape Lowland Freshwater Wetland vegetation and lies between Hangklip Sand Fynbos on the north side, with its astonishing variety of protea species (Pagoda bushes, Conebushes, Pincushions), moisture loving Erica, and many geophytes (bulbous plants), among them Gladiolus, Ixia, Watsonia and more. Overberg Dune Strandveld covers the dunes on the south. Dune Strandveld is really about trees. Often referred to as ‘Coastal Thicket’, Dune Strandveld is home to several species of berry producing ‘Taaibos’ (Searsia species) loved by birds. An iconic Dune Strandveld tree is the Milkwood (Sideroxylon inerme), preferred habitat of the Large Spotted Genet (Genetta tigrina). Sunhats and clothing suitable for changeable weather, water, drinks and trail food are essential. Kayakers must expect their footwear and shorts/trousers to get wet! Kayaks and personal flotation devices (‘life jackets’) are provided. Kayaking the Kleinmond Estuary is weather dependent. 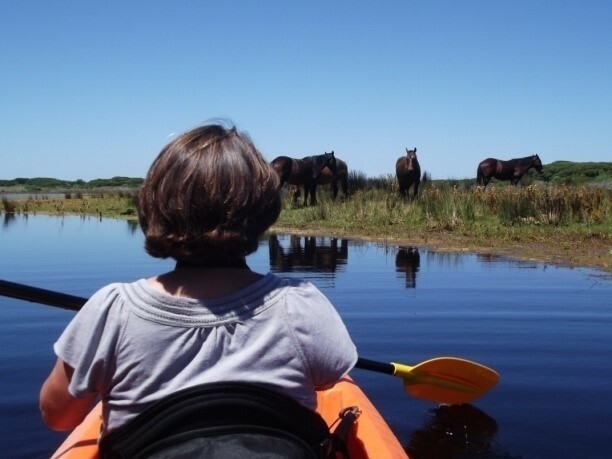 If more than three, hire of additional kayaks/canoes: R240.00 per additional kayak/canoe. To book, contact us using the form below.